Bitter Orange Marmalade has got a sophisticated flavor that pairs perfectly with thick slices of toast, biscuits, and English muffins. Cut the oranges in half and juice them. Set the juice aside. Put the seeds and pulp into a saucepan with 2 cups of water and let boil for 30 minutes. Remove all the seeds and discard them. Meanwhile slice all the rinds into small strips. Put the rinds, the juice, pulp and the vanilla bean into a heavy bottomed pot. Use a smallish sized one since this is a small batch marmalade. Add the sugar and whiskey and boil for another 20 minutes, or until the marmalade is thickened. Stir often, scraping down the sides of the pan. You will see it darken and turn translucent at the end. Watch it carefully at this stage so it doesn't scorch. You can test a little bit of the jam on a cold plate to see if it gels, but if you have cooked it long enough, and it has reduced down and is thickening in the pot, you will be fine. Marmalade will continue to gel as it sits in the refrigerator. 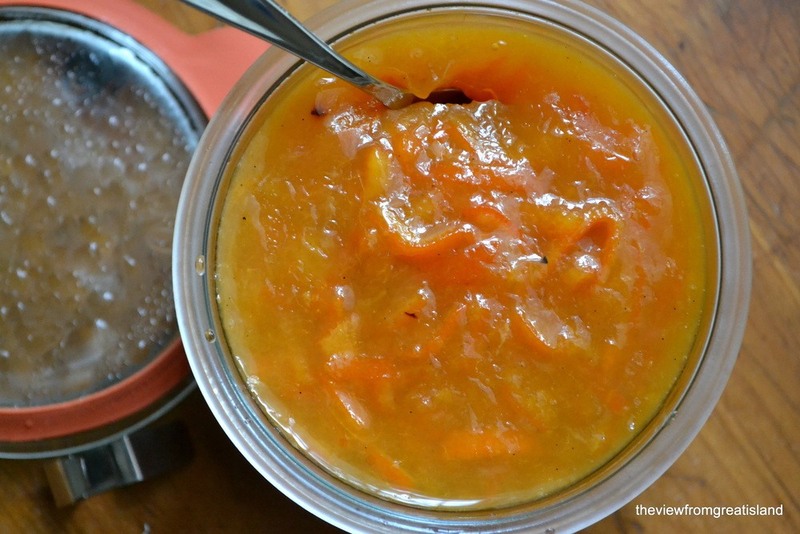 Remove the vanilla bean and ladle the marmalade into glass containers with tight fitting lids. Cool completely and then refrigerate.